Printable coloring and activity pages are one way to keep everyone happy (or at least occupied) while Thanksgiving dinner is cooking. The websites listed below offer a variety of Thanksgiving or autumn themed coloring and activity pages that should be a hit at keeping tiny hands busy. In many cases, kids can color the pages or complete the activities on your computer instead of on paper, if you prefer. When it comes to coloring, Crayola wrote the book. The Crayola website offers more than a dozen coloring and activity pages, including five Bingo boards. You can print any of the pages to color, or color them online, using digital crayons, pencils, and markers. In addition to coloring turkeys, people, and food, kids can draw faces, create Thanksgiving cards and place settings, write Thanksgiving messages, and cut, color, and assemble a paper turkey. This UK-based site offers Thanksgiving coloring pages, games, printables, puzzles, and mazes for kids of all ages. 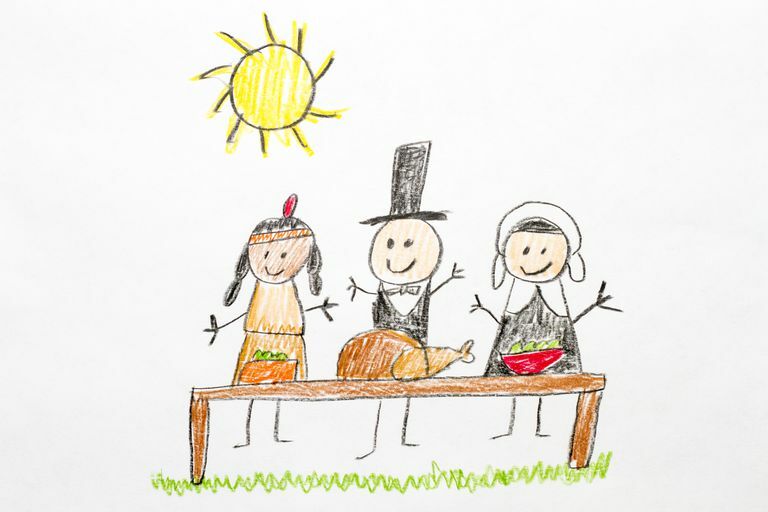 The coloring pages include Pilgrim and Native American boys and girls, Pilgrim ships, turkeys, and Thanksgiving dinner. The crafts pages show kids how to make paper cup Pilgrims and turkeys, handprint turkeys, a harvest basket, a salt dough apple wreath, and a Thanksgiving tree. The printable pages include drawing lessons, acrostic puzzles, mazes, word searches, word scrambles, stationery for writing notes and letters, and scrapbook paper designs. PaperToys.com specializes in paper toys and models, some of which are fairly elaborate. The PaperToys.com site shows a color version of the turkey model's parts, for reference, but the printable version is black and white only. Not a huge deal, but the model might be a bit more durable if you didn't need to color it with crayon, colored pencil, or markers. Still, it's a fun project and should keep kids busy for at least 5 minutes. Younger kids may need supervision with scissors and a little help with the cuts and folds. If you do it right, you can sneak some educational worksheets in among the coloring pages and Bingo games. The AllKidsNetwork website has a collection of worksheets that are as fun as they are educational. For younger kids, the worksheets include counting practice, same/different, and word-picture matches. For older kids, the worksheets include word scrambles, word searches, missing letters, a Thanksgiving decoder puzzle, and addition and subtraction exercises. There are 22 worksheets in all. The printable pages on the Plimoth Plantation website feature some of the exhibits available at Plimoth Plantation in Massachusetts. Several of the pictures feature Felix, the Mayflower kitten. While you're on the Plimoth Plantation website, be sure to click the Talk Like a Pilgrim link in the Just for Kids section, to learn what the Pilgrims called cats, skirts, and fireplaces, among other things. There are more than two dozen Thanksgiving coloring pages to choose from on TheTeachersCorner.net. The images include pumpkins, turkeys, Pilgrims, ears of corn, and cornucopias; most images also include a Thanksgiving greeting. The site also includes a number of Thanksgiving-themed lined journal pages that kids can use to start or maintain a journal or write stories; a printable guide to making a box to hold nuts or small candies; printable word search and word scramble puzzles; and printable activity cards. The Super Teacher Worksheets website is chock full of activities that are both educational and fun. With the mystery picture math worksheets, the goal is to solve the addition, subtraction, multiplication, or division problems, and then use the answers and the color key at the bottom of the page to color the turkey. There are three Thanksgiving-related spelling worksheets for second graders that challenge students to unscramble words and sort them in alphabetical order, plus a Thanksgiving crossword puzzle, word search, and crypto-code riddle. There's also a Thanksgiving Bingo game and instructions for cutting out and assembling a Thanksgiving diorama. Kidzone has a collection of printable Thanksgiving-themed math and word problem worksheets for kids in grades 1 through 5. The math problems cover the basics (addition, subtraction, multiplication, and division), as well as other concepts, such as carrying numbers, finding missing factors, working with decimals, and division with and without remainders. Each worksheet has a lighthearted illustration that lessens the stress of dealing with math, even if just a bit. You can create multiple versions of each worksheet by clicking the Generate New Worksheet link at the top of each worksheet page. The Kidzone website also has puzzles, coloring pages, and other printables for kids of all ages. Although Holiday Crafts and Creations only offers two coloring pages, we really liked the Quilted Banner page. It's different from anything we've seen on other websites; better yet, one of the pages doesn't include a turkey. We have nothing against turkeys, but there are many other ways to represent Thanksgiving and the fall season, and something unusual always catches our eye.